Coming up with different dinners every night can be challenging. This is something I’m sure we can all relate to. Especially after a long day, spending an hour in the kitchen cooking can be the last thing we want to do. I am all for simple, yet tasty homemade meals. Within the last few weeks, I’ve made a goal to make two new dinners every night, trying out recipes I’ve saved over the years that have taken a backburner. Some of them get followed exactly as written, and others get tweaked and adjusted to make another variation. When contemplating what to make the other night, I started thinking about some of the ingredients in the fridge that were about to go bad if not used soon. We’ve all been there, right?!?! I personally hate being wasteful, so when things have to get thrown out I feel a sense of guilt and promise to do better the next time I buy groceries. Two of the ingredients on this particular night were what remained of heavy cream and broccoli. I started digging through recipes and found one that called for the heavy cream. As a plus, I already had everything else important that it needed as well. And the broccoli could be added easily enough. This recipe was for Chicken Alfredo dipping sauce served with baguette slices, however since I was looking for more of a meal instead of an appetizer, I tweaked the recipe to make a pasta. It did not disappoint. This is probably the best homemade alfredo sauce I’ve made and will be replacing the one that I’ve used for 12+ years. This sauce is rich, creamy, and just perfect. The pepper flakes give it just a little kick, however, the spice is not overwhelming and definitely won’t leave you running for a glass of milk. If you are sensitive to spice, you can omit the pepper flakes completely and still have a delicious sauce. Next time we are craving chicken alfredo, this will be my go-to recipe for sauce going forward. I can’t wait to try it as an actual dipping sauce with the baguette slices. I’m sure it is just as addicting. Spray a medium-sized skillet with oil. Season the chicken with salt and pepper. Over medium-high heat, cook chicken for 5 to 7 minutes or until the edges of the chicken begin to turn white, flip chicken breast over and continue to cook until done and a golden color on both sides. The chicken should cook for approximately another 5 to 7 minutes. Allow chicken to cool before cutting into bite-sized pieces. While chicken is cooking, bring a large pot of water to a boil. Add pasta and cook until tender. Boil times will vary depending on pasta type. Once pasta is done, drain water. Cook broccoli until soft then chop into small pieces. Preheat your oven to broil. 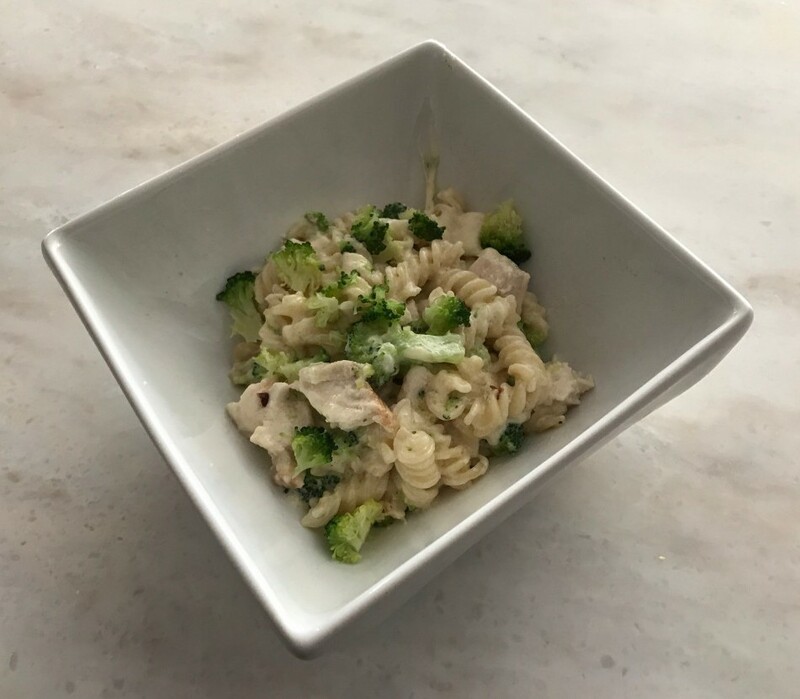 Combine the Alfredo sauce with the chicken, broccoli, and pasta. Place into a 1-quart casserole dish. Top with mozzarella cheese. Place casserole dish under the broiler and allow the cheese to brown. When the Mozzarella cheese just begins to brown remove from the oven. Mmm… I can just imagine the taste. I’m going to try this recipe thanks for sharing! It is a quick and easy meal, and so tasty! Depending on if you have leftovers, it heats up really well the next day too. It really is, and so easy too! Prep time was right around 15 minutes, then another 3 in the oven. Perfect for those days where you don’t have a lot of time or energy!